Although the tropical weather may negatively impact medical devices, technologist Ly Hoang Minh claims knowledge of imported medical equipment and can easily and cost-effectively fix broken devices alike foreign technicians. Entering biomedical equipment technician Minh's house in the southern city of Can Tho's residential quarter 91B, one can easily spot a wide variety of machines and medical equipment lined up on the ground floor, waiting to be fixed. A long compartment shelf placed against the wall contains various types of electronic components. "They are similar to remedies for specific diseases. The medical device will run again if it is prescribed the right remedies. Most importantly, one can be assured of durability, which is alike a doctor treating the root cause of a patient's disease," Minh said. It took Minh several hours to meticulously examine every integrated circuit of the colour ultrasound scanner before he discovered that its mainboard was malfunctioning. While foreign repairers would charge about VND150 million (US$7,100) to have the scanner fixed, Minh claims to take only VND29 million ($1,400) to mend the machine. "They charge exorbitantly for their services, probably thinking that they monopolise the medical equipment repair market. I'm not like that and offer lower prices provided I know why it is broken," he said. To find appropriate spare parts, Minh explores various foreign websites in order to purchase and even order repair guides to assist his work. In addition to being a medical equipment repairer, he is also a specialist, who can install medical devices and industrial wastewater treatment systems, emergency alert systems on rescue buses and trains, and automated phone notification systems for hospitals. Graduated from the Ho Chi Minh City University of Technology's Electrical and Electronics Engineering Faculty in 2001, Minh began his career as a hired worker at the Can Tho City Centre for Preventive Health Care and then worked with the Company for Medical Equipment and Materials. Having worked in these institutions for six years, he was well aware of the difficulties that poor hospitals encountered, such as that of foreign medical equipment repairers or medical equipment distributors in Viet Nam, who try to monopolise the market by often charging them cut-throat prices for repairing their medical equipment. "Whenever they received orders to fix broken medical equipment, they immediately replaced the older ones with new mainboards or even modules," Minh said. With the firm belief of being able to work as a medical equipment repairer, Minh then decided to establish his own company in 2010, specialising in the repair and maintenance of medical equipment. Undoubtedly, it is never an easy task to be an employer. He had to deal with wide-ranging issues at the onset, from fund shortages to difficulties encountered in employing staff and looking for clients. "I had to borrow money from friends and relatives to buy components and equipment, as well as paying my staff's salaries, electricity, and water bills," Minh recalled. "I could not sleep whenever the time came to make the payments. On many occasions, I had to borrow money at high interest rates from loan sharks to pay for the workers' salaries," he said. To have a contingent of highly skilled staff, Minh has employed young technicians in the 25-28 age group, who have graduated from vocational training schools rather than recruiting university graduates. He also concurrently put in efforts to train them and work with them on broken medical devices. It was common for them to work until midnight. "All I want from them is that they know their job well and have a passion to do their work," Minh said. Finding clients is another major task. In the beginning, he frequented hospitals to befriend the staff so that he might get some contracts for mending medical equipment. "Many hospital administrators ignored my invitation because they did not believe that my small company can fix their medical equipment, whereas others were very straightforward in saying that their equipment was too complicated for me to fix," Minh said. Yet, he was persistent enough to convince some hospitals, seeking their permission to give him the opportunity to work on and fix their broken equipment for free. Empathising with this constant insistence, the hospital authority finally agreed. He initially began examining a colour ultrasound scanner belonging to a private hospital and discovered that its mainboard was broken. "When I told the hospital chief that I can fix the machine at VND29 million, he did not trust me and asked me to provide a six-month warranty for it. Moreover, I would only be given payment for my services after three months since the machine had been guaranteed," Minh said. Finally, the ultrasound was not only fixed, but also operated well for the past three years. "Well begun is work half done," Minh said. Since then, the hospital has asked him to mend a broken cardioversion, patient monitoring equipment, breathing machine, cardiogram, and X-ray machine. According to medical equipment manager of Thot Not district general hospital in Can Tho Province, Trinh Hoang Diep, Minh is amongst the handful of engineers in the area who are capable of repairing medical equipment. "He does his job very well. Thanks to him, our hospital has saved a lot of money," Diep remarked. Even as earning contracts for fixing out-of-order medical equipment is already difficult for Minh, but having sufficient capital for running the business is even harder. Hospitals and clinics have to submit a request to their managers to have their broken medical devices fixed. The approval process takes time. Due to this, Minh is left with no option but to accept the condition of mending them first and then taking the payment for it later. Thus, it is not uncommon for him to run high and low to borrow money from friends, relatives and banks. "There was a contract worth some billion dong, so I had to sign it at any cost," Minh said. Sometimes it consumed extra time because he had to fill the forms, make technical drawings, and prepare regular receipts before he was able to get the payment. There are contracts wherein he received the fees after three to four months. Minh specialises not only in repairing medical equipment, but also designs and manufactures medical devices. It was last year when Minh accidentally came to know that the doctors at the Hoa Binh hospital in Bac Lieu Province wanted to purchase a stomach cleaning machine. 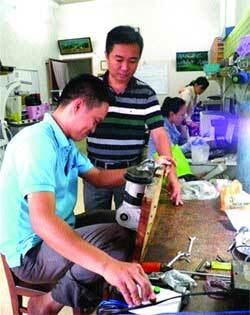 Leaping in at the opportunity, Minh asked the hospital manager to hire him to make the machine. Luckily, his request was approved. The machine was built and put into use in a month's time. The hospital accepted the creation of this brainchild with a positive feedback that the machine was user-friendly and capable of offering effective emergency aid. Thereafter, Minh had a contract to install a central oxygen supply system for the Hau Giang hospital. His work there too was highly appreciated. Good news has wings. His company has attracted many hospitals and clinics in the provinces of Tien Giang, Vinh Long, Can Tho, Bac Lieu, and Ca Mau. His fame has spread far and wide. In 2009, he successfully designed a mainboard for a spraying machine, which also functions as a sleeping lamp for a Singaporean manufacturing agent.